After you create a screen snapshot policy and set it to Record mode, screen snapshot will be taken every once in a while, and data will be stored automatically in the server computer, to help IT mangers to flexibly monitor and control employees' use of computer and their all activities. Click menu Monitoring > Search Screen History, then specify search conditions including time range and name or IP address and click Search. Records of screen snapshots including ordinal, date, computer, sessions, beginning and ending time will show below and IT managers can quickly find screen history they need. 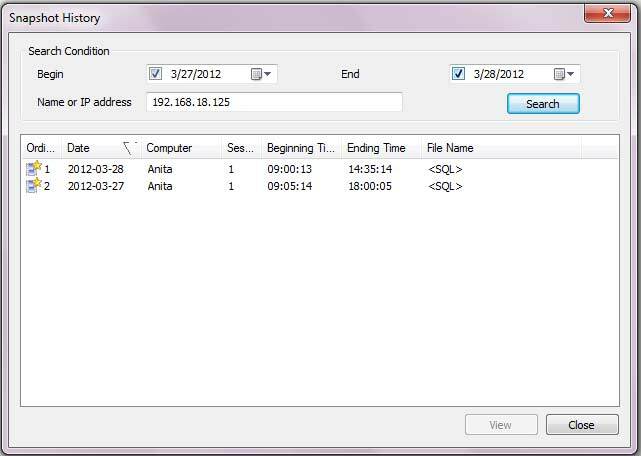 In the following example, screen history records range between March 27, 2012 and March 28, 2012 of PC which IP address is: 192.168.18.125 will display. Name: Name of computer you want to search. Support fuzzy query. IP address: A specified IP address or a range of IP addresses are available. Sessions: Number of computer users. File name: If screen data is stored in SQL database, file name would be <SQL>. If screen data stored in the SCREEN directory, file name would be the same as data of screen. Double-click a certain item or choose one and then click View to view detailed information of certain screen history.